The Fixer Upper program and Berkshire Hathaway HomeServices are teaming up to offer viewers a chance to win a $50,000 “Good to Know” prize package including a consultation from Chip & Joanna Gaines, hosts of the HGTV Fixer Upper series. To enter and for complete details, visit www.50kFixUp.com. Ends 6/15/15. Coming to Shelton April 9th! YOU’RE INVITED TO OUR GRAND OPENING! APRIL 9, 2015 - 4:00 TO 6:00 P.M. ENJOY SOME HORS D’ OEUVRES. 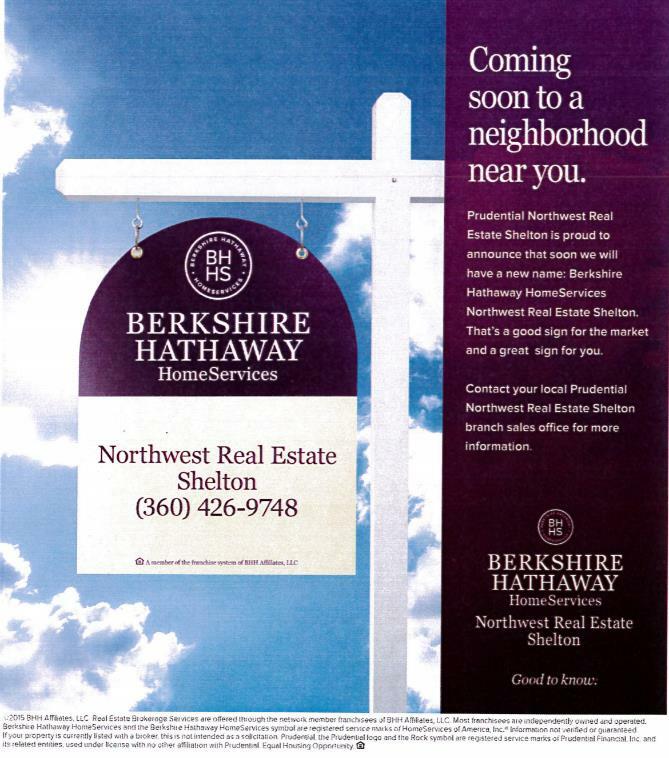 RIBBON CUTTING WILL BE AT 4:30 P.M.
Mason County home sales are up over 2013 sales for the first three months of 2014. The number of sales are up 20%, the median price is up 15% and the average time on the market for sold properties is down 16%. All good signs. Mason County like many Counties in Washington is lacking new listings priced at market prices. The average time on the market for the active listings is 173 days compared to 108 days for sold properties. The median price for sold properties in Mason County is $142,500 compared to the median price of active listings which is $189,000. "The only thing holding back sales is the lack of inventory," said John Deely, a member of the Northwest MLS board of directors. There are many reasons potential sellers should consider selling now," said Mike Gain, CEO and president of Berkshire Hathaway HomeServices Northwest Real Estate in Seattle. There is less competition now at the beginning of the spring selling season (usually the busiest time of the year) and interest rates are still very low but will likely rise, he noted. "Now is a great time for move up sellers/buyers who can sell their home quickly and secure another at today's prices and today's lower interest rates," Gain suggested, emphasizing, "Buying a home today is going to prove to be a smart investment in the long run." Gain also said there are more first-time buyers than he has seen in many years. "Many are very well qualified for a mortgage and have more than minimum down payments. It's heartbreaking to have so many good purchasers and not enough good inventory to satisfy their needs." Pricing a home is more art than science. Get beyond the standard information you can search online like square footage, bedrooms, bathrooms, year built, etc. Homebuyers should be on the lookout for some of these hidden gems that may undervalued (or not even included) in the listing price. Real estate professionals are in agreement, there are certain hidden gems in a home that have the potential to add long term value for a buyer and might not be actually reflected in the selling price. Active Rain asked over 1500 real estate professionals three primary questions. Their answers shed some light on the hidden gems every buyer should be on the look out for and also that every seller should consider highlighting when they market their own home for sale. See more at Active Rain! Let's take a look back at the real estate activity here on Harstine Island. In 2013 28 homes were sold on this side of the bidge. Breaking that into two groups, 9 of those were sold at Harstene Pointe. The rest were sold on the island proper, and those home prices ranged from $59,000 for a 2 acre lot and a 576 square foot home to a $650,000 low-bank waterfront home on 3 acres. At Harstene Ponte, prices ranged from $95,000 for a 900 square foot cabin to $349,950 for a 2,750 square foot home over looking Indian Cove Marina. Right now 14 homes are for sale on the island ranging in price from $79,000 for a 759 square foot cabin on one-third of an acre to $650,000 for a waterfont home at the south end. At Hartsene Pointe 20 homes are for sale ranging in price from $96,750 for a 760 square foot home to $419,000 for a 2,060 square foot home with a view of the water. Harstine Island home sales totaled 19 through September 2013, up one sale from the the same period in 2012. Sale prices are up down $55,000 for the same period. See Harstine Island home sales and listing stats. Lake Limerick home sales through August 2013 are up by 2 when compared to the same period in 2012. Sale prices are down for the same period. See Lake Limerick home sale and listing stats. Timberlake home sales through September 2013 are up by thirteen over the 2012 sales through the same period. Median home sale prices are slightly below 2012 levels. See Timberlake home sale and listing stats. Alderbrook median home sold prices are up over $91,000 over 2012 YTD levels. Eleven homes have sold through September 2013, compared to 19 for the same period in 2012. See Alderbrook home sale and listing stats through September 2013.